Flair Promotions Agency is an event staffing and promotions agency in Johannesburg, bringing the extraordinary out of brand activations and promotional events. Furthermore, what you should know about Flair is that we handle private and corporate events with flair, whether big or small and create exciting activations and exhibitions that bring brands to life. We supply top-quality event models and promotional staff for Corporate Events, Trade-shows Exhibitions, Private Functions, Golf days, Track Days, Flyer distributions and more; to help our clients attract the right kind of attention and the right kind of audience. We recruit the best people for the job – our experienced and reliable promotional staff is a cut above the rest and will help bring the full exposure that your company deserves. We are passionate about our clients and providing quality event staffing solutions. Our dedicated team will provide the perfect models for any event and add a distinctive ‘touch of flair’ that we are known for. We can help you with any event or activation, making sure that your event is fully staffed and managed throughout. We understand that every client has a unique idea of how their brand activation and event should appeal to consumers and/or guests, therefore we strive to have the best, most gorgeous and consistent promotional talent available. To us, it’s not just about managing your event’s staffing needs, it’s about making a lasting impression that lasts long after your event is over. Our promotional staff are hired to assist in creating an image for your brand as well as draw positive attention to your event, they serve to provide information about your product or service and make it appealing to consumers while delivering a live experience that reflects on the product or service he or she is representing. We offer a wide range of experienced staff for you to hire that are trained to increase product awareness, provide product information and create an association in the consumer’s mind between the product/brand, generating immediate sales. Our promotional staff ensure the image of your event is of top class, with the most beautiful, social and confident promoters on our database we aim to provide our clients with only top-quality hosts/hostesses, party models, dancers, shooter models and more. 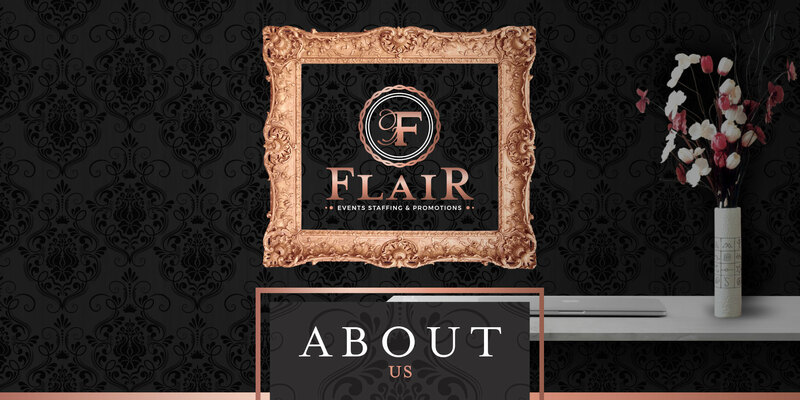 We understand the importance of your event and whether it is hosted at a club or a private venue with the help from our Flair team your event is sure to be well staffed and managed through-out.